FILE - In this May 24, 2009 file photo, Mari Hulman George, chairman of the board of the Indianapolis Motor Speedway, gives the command to start engines at the start the 93rd running of the Indianapolis 500 auto race at the Indianapolis Motor Speedway in Indianapolis. Hulman George, chairman of the board emeritus of the Indianapolis Motor Speedway, died early Saturday. She was 83. Indianapolis Motor Speedway announced Hulman George’s death early Saturday in a statement and said her family was by her side. 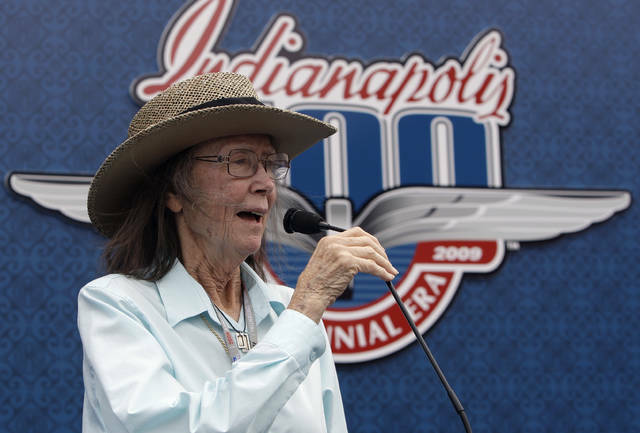 INDIANAPOLIS — Mari Hulman George, the “quiet pioneer” of auto racing who was instrumental in the expansion of Indianapolis Motor Speedway and became known to millions of fans over the years as the one who ordered countless drivers to start their engines before races, died Saturday. She was 83. Hulman George, the speedway’s chairman of the board emeritus, died in Indianapolis with her family at her side, the speedway said in a statement. Hulman George was IMS chairman from 1988 through 2016. Her father, Anton “Tony” Hulman Jr., purchased the speedway in 1945 and saved it from demolition after World War II. Racing and the facility became a staple of Mari Hulman George’s life. “Racing is filled with passionate people, but you’d be hard pressed to find anyone more passionate than Mari Hulman George,” said Tony Stewart, an Indiana native who grew up idolizing the Indy 500 and the speedway. She launched numerous philanthropic efforts, including benefits for Indiana Special Olympics and complimentary field trips for Indiana’s schoolchildren. She focused on the arts, health care and, in particular, animal care. She served on the board for Hulman & Company, IMS and the IMS Foundation, as well as First Financial Bank, a publicly traded company headquartered in Terre Haute. Hulman George was especially close to four-time Indianapolis 500 winner Foyt, whom she met a year before his 1958 Indianapolis 500 debut. She and Foyt placed a commemorative “golden brick” into the famous “Yard of Bricks” start-finish line in May 2011 to celebrate the 100th anniversary of the inaugural Indianapolis 500 and the 50th anniversary of Foyt’s 1961 victory. Hulman George hosted for years two events during the lead-in to the Indianapolis 500. The “Racers Party” took place annually on the opening weekend of the “Month of May” for the entrants of the Indy 500, and a “Friends of the 50s and 60s” event was held the week between qualifying and the race to celebrate with racing veterans. “Mrs. George was committed to the long-term health of the Indianapolis Motor Speedway as a treasured Indiana asset, and her stewardship as chairman set the tone for staff and others involved with IMS,” said J. Douglas Boles, president of IMS.